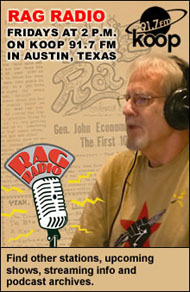 Trudy, who helped us start ‘The Rag’ in ’60s Austin, was a warm and generous friend. Somewhere along the way, she became a wonderful poet. Trudy’s two collections reveal much of the same sensitivity friends saw in her years ago. If you are lucky, as I have been, sooner or later you will have the pleasure of seeing a dear friend from years past and feeling that, whatever profound intervening experiences you then may share, you’re picking up right where you left off. Love and loss, creation and destruction, youth and age; change is ceaseless but in some people there is an essential core that you feel you would know even in another life. In another life, in a town that was nothing like the Austin of today, I knew Trudy Stern by her then-married name, Trudy Minkoff. She and her grad student husband, Bobby, and my husband George Vizard and I, came to know each other as peace and free speech activists around the University of Texas campus. 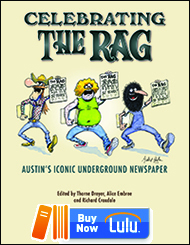 We were all among the founders of The Rag in 1966, Austin’s radical underground newspaper and forerunner of The Rag Blog. 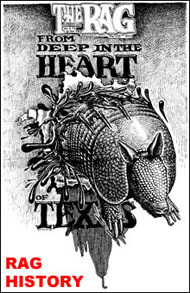 Trudy’s whimsical but dead accurate pen-and-ink drawings graced many early Rag editions. The fourth issue covered the first all-woman anti-draft demonstration in the U.S., at Austin’s Selective Service office, an early manifestation of anti-draft organizing in Texas and of the women’s liberation movement just germinating. Trudy and I, and several other married women who participated, signed the group statement demanding an end to the draft with our married names, but we talked it over first. Beyond the political, I came to know Trudy as a warm and generous friend. The petite, pretty native of Buffalo, New York, was also an inspiring “energizer bunny.” Her home was a bright, snug haven and there was always something delicious in the oven or on the table. This was one of three Austin Left homes where I was introduced to Judaism as a way of life rather than an old religion, as well as to the art of drinking tea. Trudy worked as a nurse and I always thought how nice it would be, if one were ill, to have a caregiver so gentle. Towards the end of the ’60s, winds of change blowing hard, we began to lose touch. Towards the end of the ’60s, winds of change blowing hard, we began to lose touch. Bobby and Trudy and other friends went “back to the land.” Visiting New Mexico one summer, I watched in amazement as Trudy produced a perfect layer cake from an oven that was nothing more than a hole in the ground in a place called Apache Canyon. I went on to California for a while; then coming back to Texas through New Mexico, held the Minkoffs’ new baby girl in my arms one evening while a blizzard roared outside their cabin door. Somehow, it seems that 40 years have passed since then! Thanks to the marvels of the Internet, Trudy and I have been “reunited” on Facebook for a couple of years. But that’s a pro forma connection in many ways, a string tied around a memory. How satisfying, then, to sit down over a pot of tea with her recently and find that same warm, vivacious spirit, as though the intervening years had never been! Even more satisfying, and somehow miraculous, this same friend has released an inner persona totally unknown to me in that earlier life, becoming not only a sister in the old Movement sense, but a sister in poetry! Trudy Stern returned to her maiden name and, after many wanderings, to her home town. She and husband-of-30-years-now Michael Morgulis live in the house in Buffalo where she grew up, and where now her/their three daughters have grown up as well. For about five years, Trudy ran a teahouse where she and Michael sponsored poetry readings and, as Local Color Editions, published poetry broadsides and portfolios. They were intimately involved in the poetry programs of the Just Buffalo Literary Center, designing and printing broadsides for the Just Buffalo’s readings by some of the most illustrious poets of the day including Diane DiPrima, Allen Ginsburg, Bobby Louise Hawkins, Robert Creeley, Ed Dorn, and others. Later she was an editor of Earth’s Daughters. Recently, continuing a long-standing interest in Asian culture (the art of calligraphy is another of her longtime accomplishments) as well as her hometown’s cultural scene, she chaired the First Annual Buffalo Cherry Blossom Festival at the Japanese Garden of Buffalo. And somewhere along the way, she became a wonderful poet. Her two collections, published late in 2013 and sharing some content, reveal much of the same sensitivity friends saw in Trudy years ago, but with a finely-honed precision of expression that I at least never knew — we women were not encouraged in the 1960s to be so verbally inclined! Ghost Dreams is the more personal of the two volumes, essentially charting Trudy and Michael’s marriage. Michael did the artwork and design for this exquisite little book, lusciously printed and hand-tied; both collections are dedicated to him. Ghost Dreams includes vintage photos of Trudy as a child and a few brief, occasionally hilarious childhood memoirs, evoking both a child’s simplicity and the simpler life of 1950s America. The Sterns, “ostensibly Jewish,” celebrated Christmas, hiding their tree in the basement playroom to avoid orthodox censure. Trudy’s mother, “formerly a Lowe from New Hampshire, celebrated everything. Christmas, Easter, St. Patrick’s Day.” About the time Trudy left home in 1965, the Christmas tree was moved into “its rightful place in the living room”; most of the more traditional Jewish families had moved to the next suburban ring of larger homes by then. From the ‘burbs, the Stern’s Jewish cousins loved to visit every year for a family Christmas celebration, with Trudy’s dad playing the part of Santa. Her Jewish grandfather was an acrobat, playing vaudeville in big venues with big acts. Her Jewish grandfather was an acrobat, playing vaudeville in big venues with big acts. In “Grace,” Trudy recalls going to a magic show at age five or six and being called from the audience to assist the great Harry Blackstone, a friend of her grandparents; a bit of magic lingers on the page. the biggest, earliest, deepest, wettest lake storm ever. sheds and roofs of rusting factories. I always thought it would be me. He’d die first, like our parents. To grow old together is a gift. Two selections from Taurus deal with illness and injury, showing the steely strength underlying Trudy’s whimsy. I lie in bed until I can lie still no more. The little muscles of my shoulder split. If I keep still, very still, I’ll heal. my thoughts go hither and yon. Only friends will follow, yes. A weak time. It furthers one to have some place to go. The poems about gardening, cooking, and making tea are both delightful and insightful. Most of all, in both chapbooks, the poems about gardening, cooking, and making tea are both delightful and insightful; the scholarly, curious Jewish child still vividly present in now-grandmother Trudy’s life. The following selections are all from Taurus. Irish, Scots, Poles and Jews. rough tubers from the dirt. in the well-fed artist’s room. garden place where not much grows. when (the) pungent gases choke me. my eyes burn, my nose run, my lungs sting. streams – heat enough to warm this room. This is the Chinese way. on the walls of the kettle. ‘Crab Eyes’ are larger. of choice for green and white teas. which is the right heat for black tea. Trudy Stern’s gift is of warming a house with love and laughter in any weather, and in these two fine collections she shares that gift with all of us. Most enjoyable! Read Mariann Wizard’s poetry and other writing on The Rag Blog. 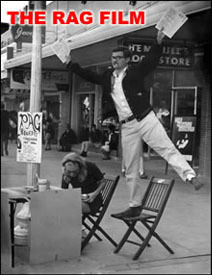 This entry was posted in Rag Bloggers, RagBlog and tagged Austin History, Books, Ghost Dreams, Mariann G. Wizard, Poetry, Rag Bloggers, Sixties, Taurus in Lake Erie, The Rag, Trudy Stern, Verse. Bookmark the permalink. so. have read mariann’s excellent article and trudy’s poetry. this is really lovely, grand and sweet. i was the local street kid that was allowed to do little drawings for the rag, back then, thanks to thorne via stephanie c. i remember trudy, can see her face as i write, as being one of the nicest and most welcoming to me, besides you, thorne, of course. and i remember her wonderful drawings that would inspire me. her poetry is as warm, observant, and real as i thought it would be. i loved the ‘rite of spring’, and ‘hot water for tea’, well, that was a delightful learning. 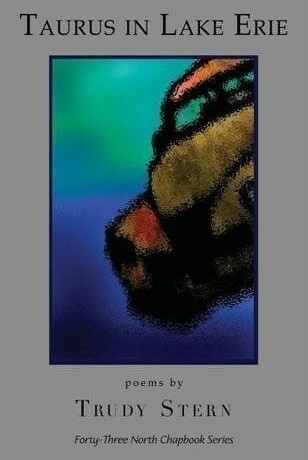 i have been in buffalo during a blizzard..i loved these poems…all, really. so, thanks mariann, trudy and thorne. No better salve for the psychic wounds of times like these. Thanks, Mariann.